Is There a Difference between Art & Craft? Recent artistic encounters have once again raised issues of whether or not non-traditional materials make certain objects craft rather than art, and is there, or should there be, a difference? Do intellectual ideas suggested by an object, despite its material, make it an object of art? Or is it enough for an object to provoke an aesthetic, not necessarily an intellectual, response in a person for that object to be considered art? For the Maloney Art Gallery show, Traditional Traces in Contemporary Native American Art (through May 24, 2010), Lynne Allen has lent several bags, moccasins and a knife sheath she has made. 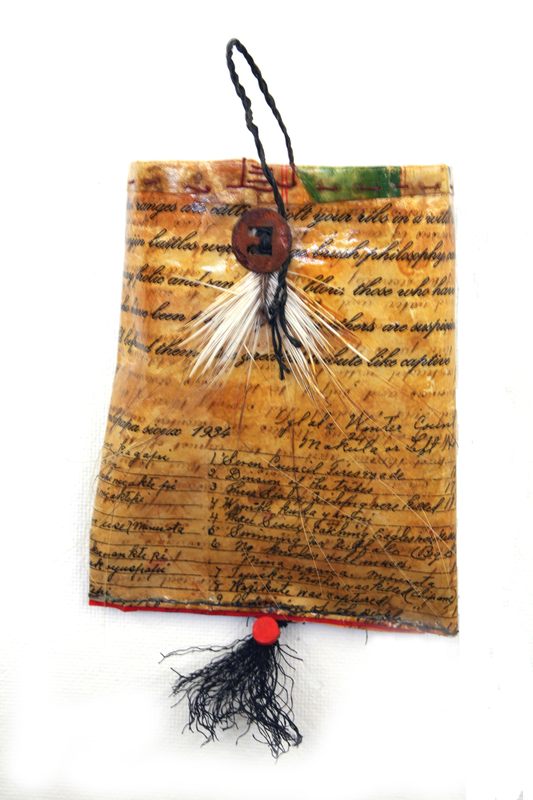 The bags and knife sheath are created out of 19th century land grant documents on vellum with porcupine quills, buttons, clasps and/or other materials. 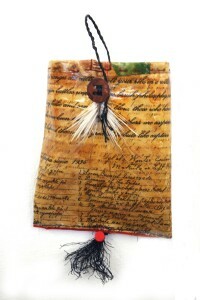 They reference earlier animal skin bags and knife sheaths that are part of Native American traditional arts. And the use of porcupine quills as a material for art and decoration has a long history as part of traditional native arts. The moccasins in the exhibition allude to the functional shoes of animal skin that Native Americans made and wore. However, moccasins were often highly decorated with bead work, considered as art work and could be worn ceremonially. Allen’s moccasins are sculpture and not meant for wear. Writing and images of nature cover one 2005 pair, Moccasin #3 made from handmade paper, etching, linen thread and handwork. 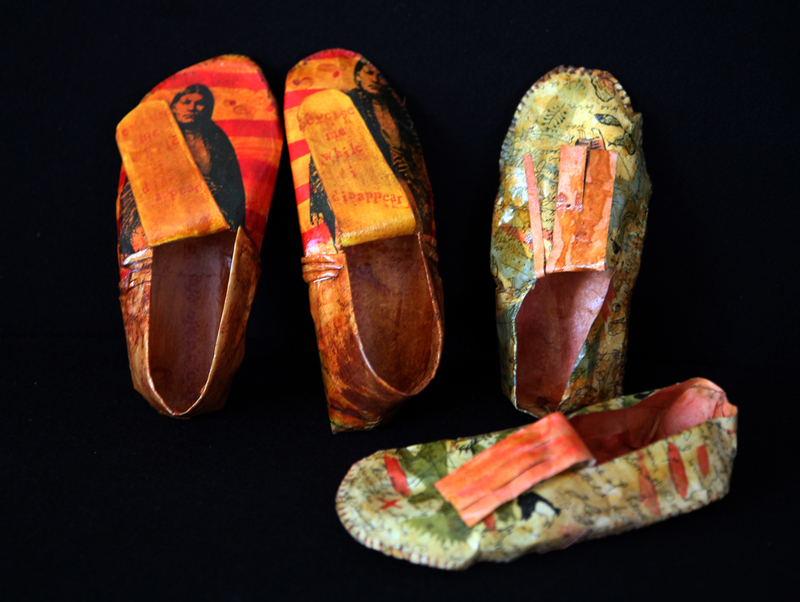 A second pair, Excuse me while I disappear (red moccasins), with the image of a Native American man on the top of the moccasins, is more metaphorically poignant, alluding to the decimation of Native American tribes, homelands, and culture when they were forced by the U.S. government to move, often by walking hundreds of miles, to reservations far from their original homelands. Here, the intersection of function, decoration, history, sewing, etching and sculpture amplifies the meaning of this art. For Native Americans, art and craft were/are completely intertwined and there was no hierarchy of art forms as had been established by Italian, French and English art academies beginning in the 16th century. But those are exactly the hierarchies that have been at work for centuries suppressing the label of art for any objects made out of materials other than paint or ink on paper or canvas, or bronze, wood, or stone for sculpture. Traditionally and historically, in western culture, objects that were functional and/or made out of other materials, fell into the realm of craft and decorative, and therefore non-intellectual, arts. In other cultures around the world, this division did/does not exist. In the 1850s in England, William Morris began to challenge this hierarchy with his Arts and Crafts movement which tried to merge so-called fine and decorative arts onto the same object. Many movements and artistic groups have taken up this challenge. Beginning in the 1970s, with a push from the Feminist movement, women and men have been successfully trying to dispel these prejudices. Widespread knowledge and acceptance of world-wide aesthetic practices has also helped. 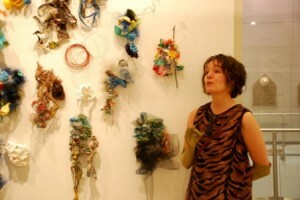 Materials such as balloons and thread, human hair, tulle, employed by Ula Einstein (https://ulaeinstein.com ) in her mixed media sculptural installation, Pulse: Change and Uncertainty, Chapter I and featured in the Maloney Art Gallery exhibition, Line, Gesture, Space, reveal that materials no longer define/confine art and creativity. 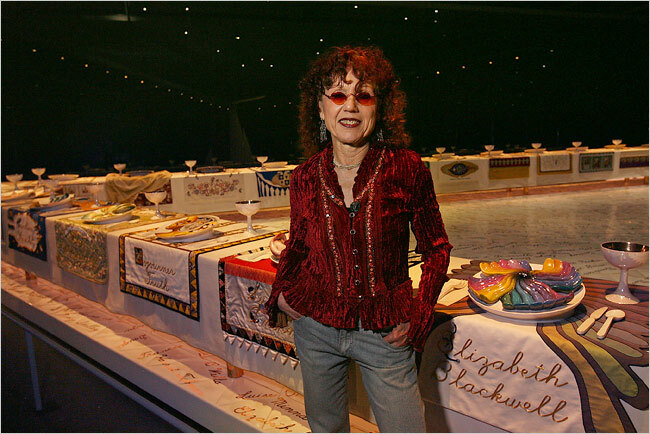 During a recent trip to the Brooklyn Museum with the students in my American Art course, I was again able to study in detail Judy Chicago’s, The Dinner Party, a monumental sculpture from 1974-79, which celebrates the contribution of western women to the history of the world (www.judychicago.com). The triangular shaped sculpture, conceptualized and designed by Chicago, was created by hundreds of women volunteers in ceramic sculpture and woven, hand embroidered and sewn fabrics, all traditional “craft” materials. 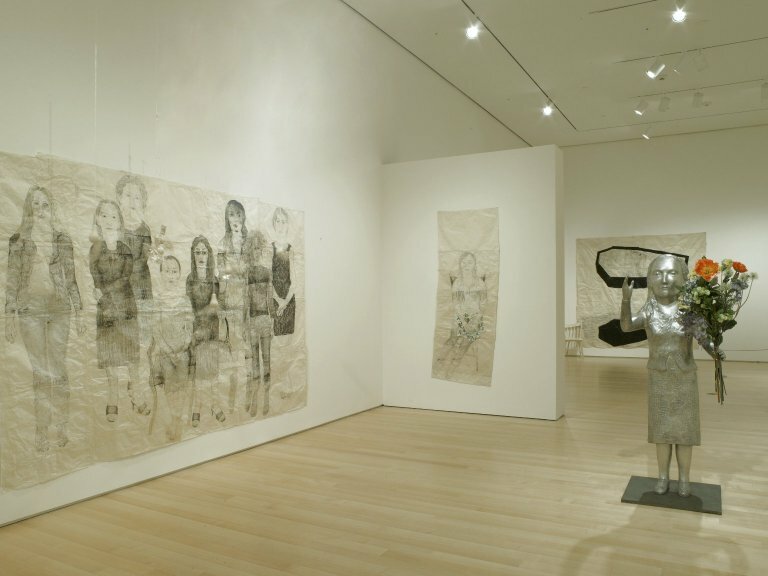 The work is a permanent installation in the Brooklyn Museum’s Elizabeth A. Sackler Center for Feminist Art. Also temporarily on view there is Kiki Smith’s (www.pbs.org/art21) multi room mixed media installation, Sojourn. Here large scale drawings of women are surrounded by fancifully decorated light bulbs, aluminum sculptures, wooden coffins with blown glass daisies, among other objects, which create a powerful meditation on Smith’s themes of birth, creativity and death in the life of a woman (http://www.brooklynmuseum.org/opencollection/exhibitions/3212/Kiki_Smith:_Sojourn). In all of the above instances, these artists chose to use materials, some of which have references to the materials of women’s traditional craft work, to comment in a profound way about the human condition. These pieces are beautiful, stirring, disturbing and enlightening.